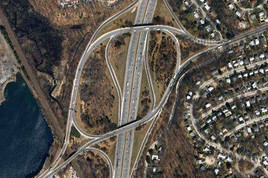 A highway project sought changes to the interchange of Route 128/I-95 and Route 20 in Waltham, Massachusetts. Tech Environmental performed air quality and noise impact analyses to evaluate the proposed changes. A mesoscale analysis of VOC and NOx emissions was performed that showed lower emissions in the future with the improvements, even with the addition of traffic from a proposed office project. The FHWA Transportation Noise Model (TNM) was used to show that traffic noise levels on a residential street will decrease as a result of the project. A highway improvement project faced air quality and noise concerns, and was further complicated by a proposed office project nearby. Tech Environmental performed air quality and noise impact analyses and confirmed that impacts would be within applicable standards.